The Pomchi, also called a Chiranian or Chi-Pom, is a crossbreed between the Pomeranian and the Chihuahua, so he may be prone to health problems that impact both parent breeds. Because the Pomchi is a relatively new breed, there is not enough data to have a thorough understanding of Pomchi health, although they are known to be a generally healthy breed. Pomchis may experience eye problems such as cataracts, Progressive Retinal Atrophy, and ectropion. Progressive Retinal Atrophy (PRA) involves the deterioration of the retina and ultimately progresses to the loss of daytime vision. Ectropion is a condition that causes the eyelid to roll outward, leaving the eye prone to irritation, infection, and injury. This condition can be treated with surgery in severe cases. Patellar luxation, a condition in which the knee joint slides easily in and out of place, may occur in small dogs including the Pomchi. This dislocation of the kneecap causes discomfort and can lead to arthritis and lameness. 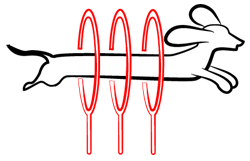 Surgery is an effective treatment in severe cases. Epilepsy has been reported among Pomchis on occasion, and they may also be prone to allergies and skin conditions. These skin conditions can sometimes be rectified with changes in diet. As with many small dogs, they may experience dental problems. Brushing your Pomchi’s teeth regularly is important. 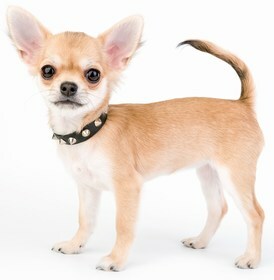 Pomchis live much longer than the average tiny dog breed, with a life expectancy ranging from 12-18 years. Pomchis are extremely loving, affectionate, and sweet. They quickly develop strong, lasting bonds with their families and are true lapdogs. They are good natured but can also be feisty, bold, and stubborn. The Pomchi should always be an inside dog and is well-suited to apartment living. Although he is fairly energetic, his exercise needs are minimal, and he should typically be able to meet these needs on his own. Of course, he does enjoy playing and going for short walks, and he should not be cooped up inside at all times. Pomchis experience separation anxiety and should not be left alone for long periods of time. They may bark frequently, especially when lonely. 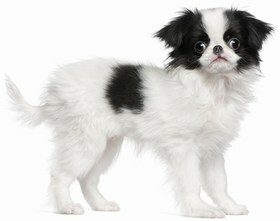 If properly socialized, Pomchis can get along well with children, people, other dogs, and smaller pets. However, younger children may startle and overwhelm a Pomchi, making him nervous. It is also important to supervise younger children with a Pomchi because he is tiny and easily injured. The same applies to larger dogs, who may hurt a Pomchi simply by playing with him. The Pomchi is fearless, protective, and seemingly unaware of his small stature, making him an excellent watchdog who will alert his family of danger. Pomchis can be housebroken fairly quickly or trained to use a litter box. Weather extremes are not good for Pomchis. If your Pomchi is outdoors in the cold, make sure he has on a dog sweater to prevent him from becoming overly chilled. If it is extremely hot, try to keep the Pomchi indoors around air conditioning or a fan, and be sure he has plenty of water. Pomchis are trainable due to their intelligence and ultimate desire to please their owners. However, he may be stubborn and disobedient, so it is important to consistently and calmly enforce rules and expectations. Use positive reinforcement by providing treats and high praise when earned, and training your Pomchi should not be a difficult task. Early socialization is important for a Pomchi to make sure he does not become shy, fearful, or even aggressive with strangers. He should also be socialized with children, dogs, and other pets. If properly socialized, your Pomchi should be able to get along with essentially any person or animal. 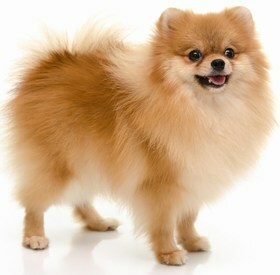 A Pomchi’s coat may vary according to which parent he takes after. He may have a single coat or a double coat. In general, Pomchis should be brushed with a soft bristled brush a couple of times weekly to prevent matting. Pomchis have sensitive skin, so do not be rough when brushing. 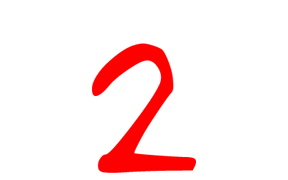 They shed mildly to moderately, and males experience a heavy shed once annually. Females shed more heavily after giving birth and while they are in heat. Bathe your Pomchi every three months or as needed. Brush teeth frequently, as small dogs are more prone to periodontal disease and other oral health problems. Trim nails as needed. Check ears regularly for signs of infection such as redness, tenderness, and odor. Pomchis have active tear ducts, so you should clean around his eyes nightly. If you allow tear discharge to build up, it can be painful for your dog. Pomchis have surprisingly big appetites for such small dogs, but in general 1/2 cup-1 cup of high quality, dry dog food daily is sufficient. A food intended for small, active dogs is recommended. Pomchis have a fairly high tendency to gain weight, so avoid overfeeding by breaking his food into several small meals daily. Remember that the adequate type and amount of food for your dog varies depending on factors like age, size, metabolism, and activity level. Be sure your Pomchi always has access to clean, fresh drinking water, especially in hot weather. A Pomchi puppy can cost anywhere from $200 to $950. Price varies according to breeder location, gender, and pedigree. If you choose to adopt a Pomchi, expect adoption fees to be around $175. Ranking takes into account a few basic factors including cost, skill level needed, high vs low maintenance and how critical regular training is to success. The Pomchi ranks a 2. 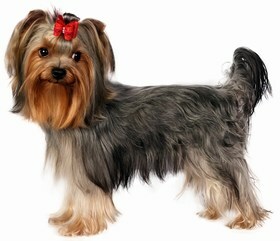 They are fairly inexpensive, have few health problems, and do not require extensive maintenance in regards to grooming. They are extremely friendly, loving, loyal, and sweet, and can adapt well to almost any living situation. They do get separation anxiety if left alone for too long, and they may be shy or disobedient if not properly socialized and trained, but overall they are intelligent and eager to please.